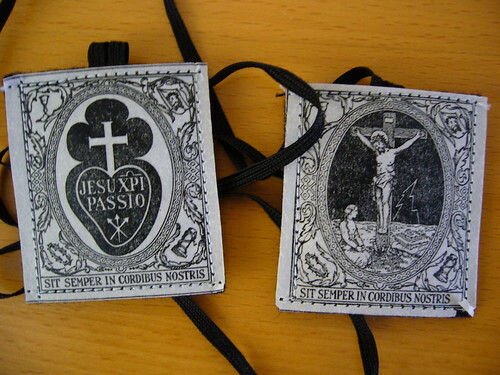 The Black Scapular of the Passion of our Lord Jesus Christ is distinguished from other Scapulars in this way: It is made of black cloth, having on the front the figure of a Heart surmounted by a White Cross. In the centre of the Heart are the letters: JESU .. XPI .. PASSIO .. meaning: “The Passion of Jesus Christ.” Beneath these letters are three nails. They represent the nails that pierced the Hands and Feet of Jesus. The Scapular represents, in a small size, the habit in which St. Paul of the Cross, Founder of the Passionists, saw himself clothed during a vision. This vision was bestowed upon him during the time he was cherishing the design of founding a new Congregation, to be devoted in a special manner to the sufferings and death of Jesus. We should not glory in anything else except the Cross of our Saviour Jesus Christ (Gal 6:14). Jesus keeps you crucified with himself. Now he is perfecting the work he has begun in you. By your sufferings even the imperfections you are not aware of are purified and your soul becomes a crystal lighted up by the Divine Sun. Yesterday, Fr. 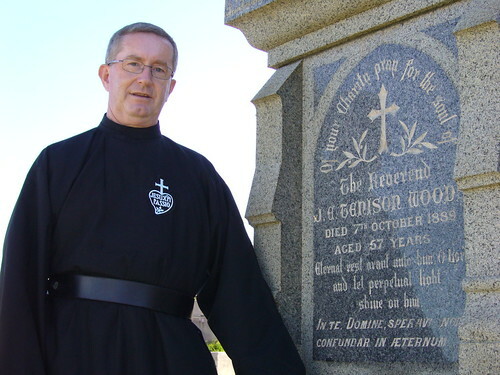 Julian Tenison Woods who is buried at the Waverley Cemetery in Sydney, received a visit and a prayer from the Passionists. Julian Tenison Woods entered the Passionist Novitiate at St. Saviour’s Retreat, Broadway, Worcs, in 1851. He spent some time after profession in Passionist Monasteries at Aston Hall and The Hyde. He left the order in 1852. Leaving his order was a bitter disappointment to the fervent novice, but he cherished the firm hope that his departure was only a temporary one. His earnestly trusting soul could not doubt that his persevering prayer would yet be heard, that his health would be restored and that he might yet return. He was still so young (too young and delicate for the life he had chosen); a little change – a few months rest – would set him right again; therefore merely accepting the cross that fell to his lot, he turned to the busy world, though he could not stifle his deep regret at leaving the peaceful Retreat – a lifelong regret from which he was never afterwards separated. On the 6th September, the doctor pronounced the case hopeless, and the Viaticum was administered. The old longing for the Religious Order which in his youth he had joined, and had been compelled to leave, still clung to him; and now, after all these long years, his hope was realised. 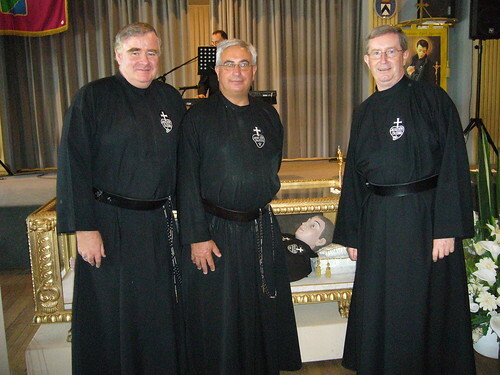 Father Marcellus, at the request of the dying priest, invested him once more in the habit of the Passionists. Early next morning, the longed for end had come, Father Marcellus being with him at the last. The celebrations for the feast of St. Gabriel of Our Lady of Sorrows continued today in Sydney when Frs. Gabriele, Tiernan and Gary joined the Sydney Association of St. Gabriel for Mass and the Procession. In July 2008 at the invitation of the Superior General, Fr. Ottaviano D’Egidio, C.P., about 50 young professed Passionists from around the world will meet in Melbourne prior to travelling to Sydney to take part in the 2008 World Youth Day. This week the planning committee for the Melbourne meeting gathered in Templestowe to begin preparations and to meet with the Province 2008 World Youth Day Committee. Pictured are Fr. Paul Francis Spencer, C.P. (Scotland), Fr. Enzo Del Brocco, C.P. (Italy) and Fr. Orven Gonzaga, C.P. (Philippines).